A quick post tonight, for a three-day weekend looms, offering little but reading (and snow, to secure us in our indoor intentions). 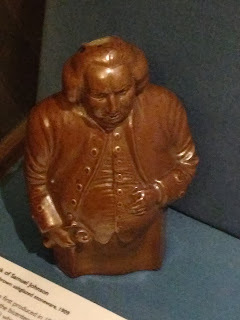 I'll merely share two poor snapshots that I took last week when an unexpected free afternoon in London allowed me to visit the house in Gough Square that Samuel Johnson lived in while composing the Dictionary . Like most house museums, it's small and unassuming, portraits and a few pieces of furniture offering the basic brushstrokes that help the imagination populate the rooms. And it's not hard to do: Johnson lumbering up and down the stairs and dominating the small rooms, the constant noise and commotion of the many permanent houseguests, the mess of papers and books that filled the garret as the work in progress progressed, letter by letter. One bit of additional period detail I didn't have to imagine: the clatter of horses' hooves echoed about the square, generated by two mounted police officers. The snapshots are of items held in a vitrine full of Johnsoniana on the ground floor, commercial items created to commemorate (and capitalize on) various Johnson-related anniversaries. The first is a Dr. Johnson-shaped flask, sold in 1909 for his bicentennial. The color is unquestionably unappealing, but the idea of having Johnson as a constant drinking companion does entice. At its top is Litchfield Cathedral, in front of which is depicted the meeting of Johnson and Boswell. (Hooray to Boswell for achieving such prominence on the knocker!) 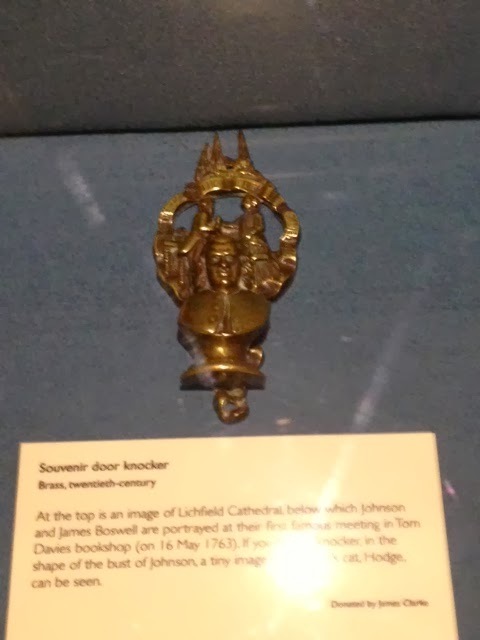 Beneath Johnson's head--reasonably cast as the active part of the knocker--is, we're told, the figure of his cat. Enjoy the weekend, folks. Happy reading to you.